Do you remember the craft storage I made/repurposed last week? Well I decided it could use a storage pot that I could hang from the second hook at the bottom, for storing things like pens, brushes, scissors, etc. 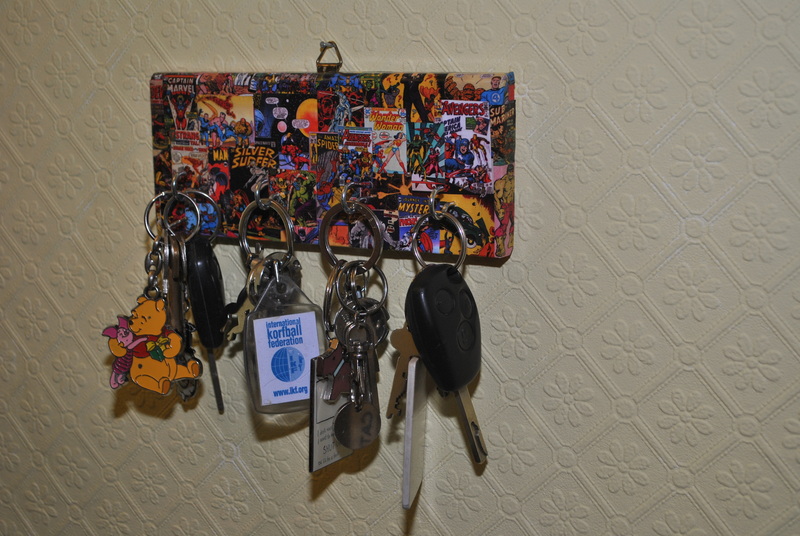 And to continue with the theme of reusing/transforming existing objects I decided to make my own! 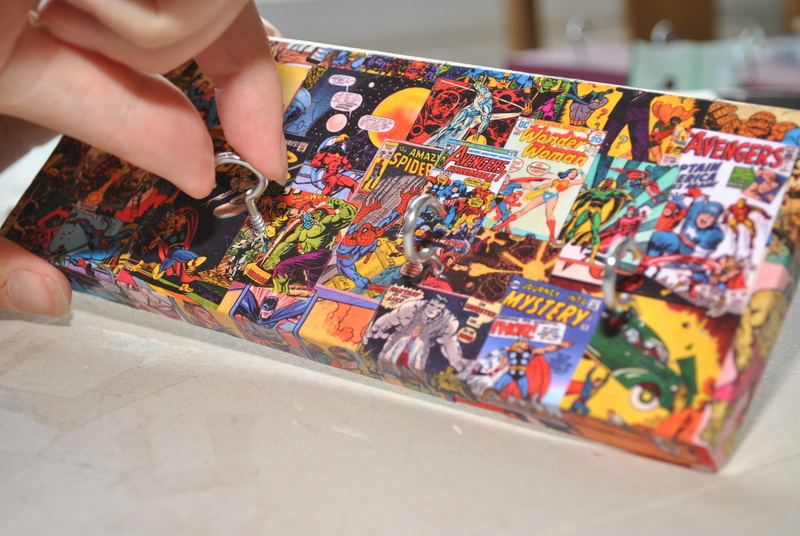 For this project I decided that an empty food tin would suit my needs perfectly, especially as there are always some empty ones kicking about, waiting for recycling day. I started by thoroughly washing out the tin, soaking off the label and removing all the sticky residue. As I was going to paint the tin, it was important that all the residue came off, otherwise the paint wouldn’t properly adhere to the surface. 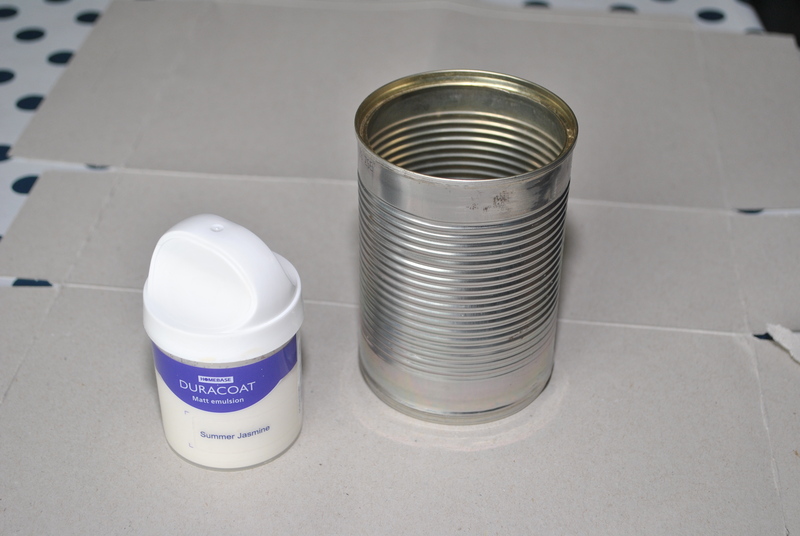 The paint I used was Homebase’s own brand ‘Duracoat’ which is suitable for using on metal. I have several tester pots of different shades of this paint left over from when we decorated our house last year. I chose a light shade of just off white for the base layer. 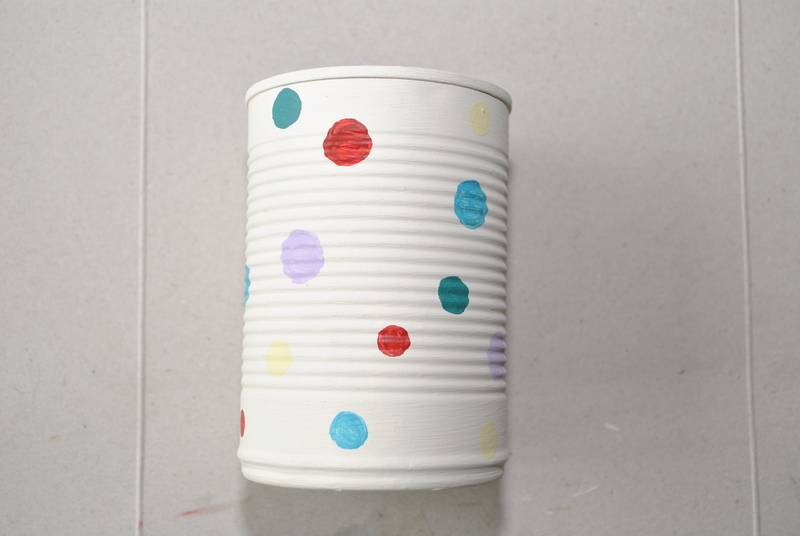 The tin required several layers of paint to give an even finish, so I gave it 3 thin layers. If you know you’re going to need to do a few layers of paint it’s generally always better to make the layers thinner, that way there’s much less chance of drips and blobs! 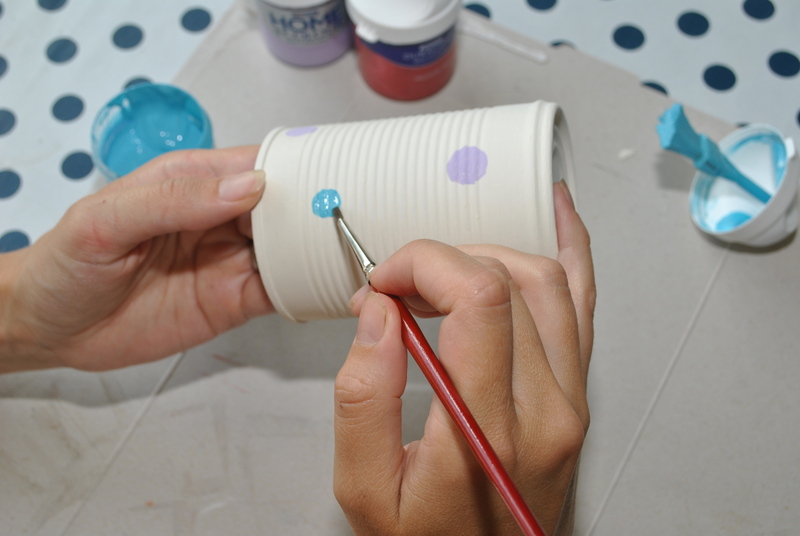 And always give the paint plenty of time to dry in between applying the different layers. 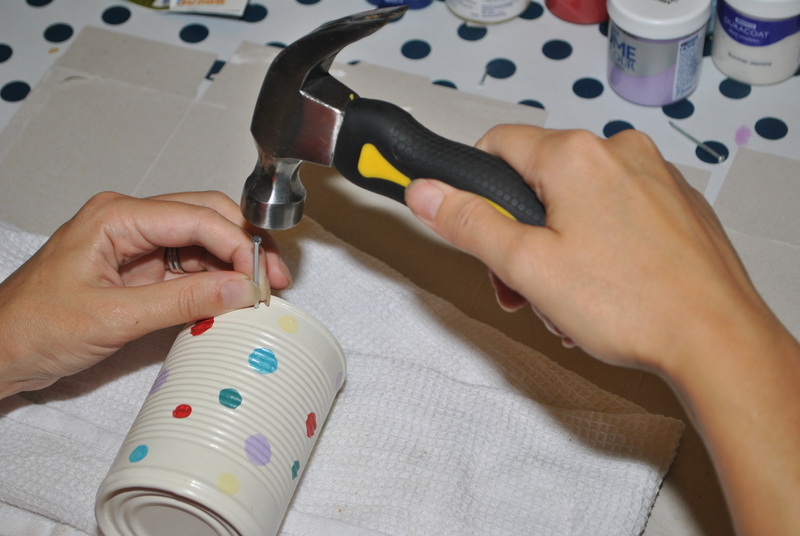 To make sure the paint doesn’t get scratched or chipped when the pot is in use I then had to seal it. 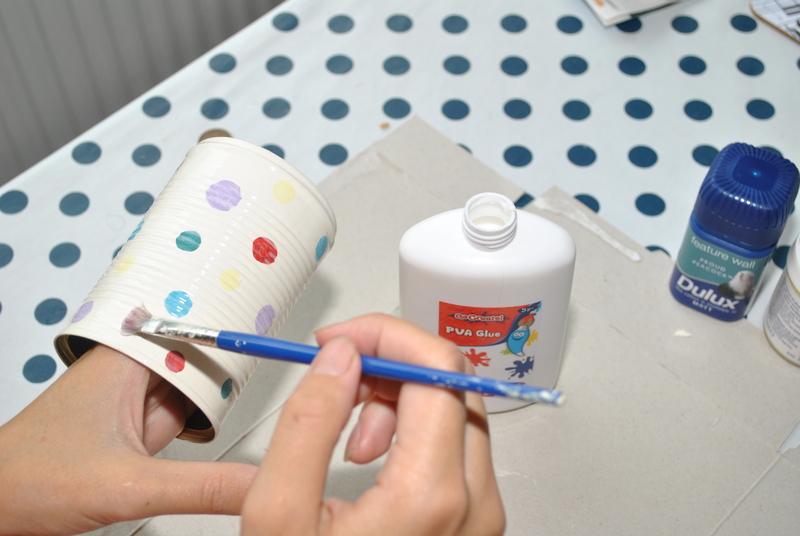 This can easily be done by applying a thin layer of PVA glue to the whole surface of the tin, and will help to strengthen it nicely. I applied the glue using a paintbrush to make sure it had an even layer all over. Once the glue finally dried (it felt like it took ages!) it was time to put 2 holes in the top to hang it from. To make the holes I laid the tin on its side on top of a tea towel. This was to deaden the vibrations a little when the hammering started! I took the fattest nail I could find and hammered it until it was fully through the wall of the tin, and gave it a good wiggle to pull it out again, then I repeated the same on the other side of the tin. 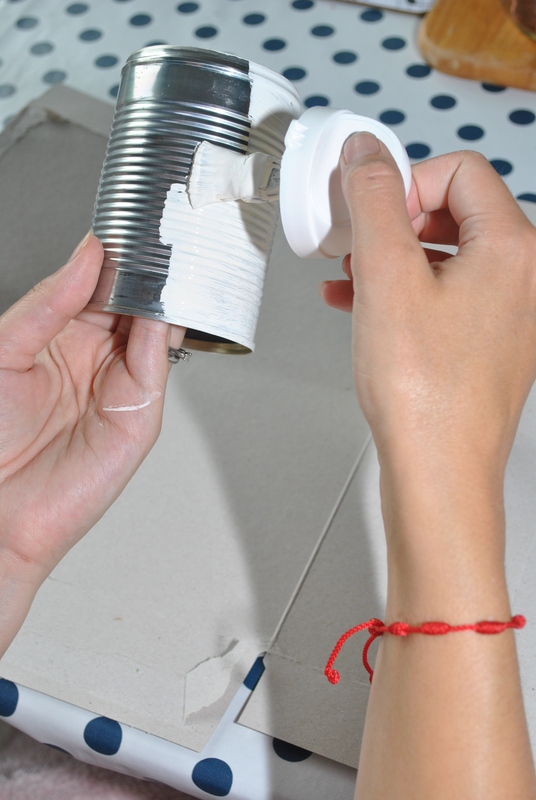 Just make sure if you do this to watch out for the sharp pieces of metal that this leaves on the inside of the tin – don’t run your fingers over the inside of the hole and cut yourself! I then took a piece of thin ribbon (which used to be a hanging loop for some piece of clothing) and poked it through the holes from the outside, knotted it on the inside and my storage tin was complete! 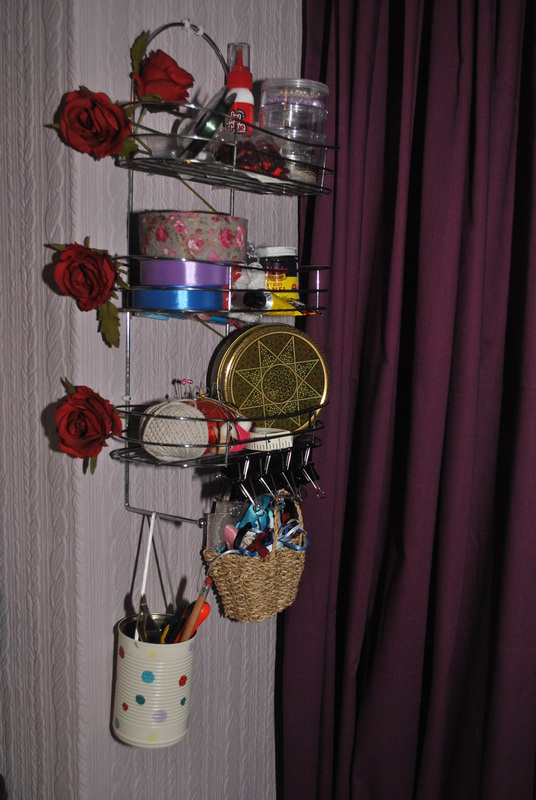 Here it is, complete with a few contents, hanging from my craft organiser. Job done! Note: As I mentioned my pot is hung using an old clothes hanging loop. A few years ago I came to the realisation that all the loops on my clothes were not necessary as on 99% of my clothes I never used them: I’m a folder not a hanger! So I started cutting them off and keeping them and you would be surprised how often a short piece of thin ribbon has been just the thing I’ve needed. Honestly, give it a go! Since we moved into our house nearly a year ago I have been meaning to make one key holder for the hall and another for the kitchen. Because much as the one we were left is useful, the quaint chicken farmyard scene doesn’t really fit with the rest of our decor! To make these I used a leftover piece of skirting board, which has been earmarked for this project all along. 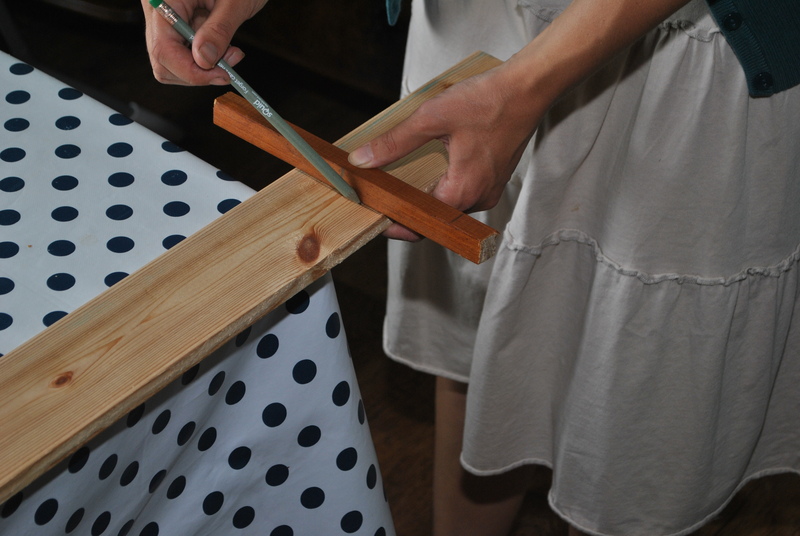 I measured and marked up the wood to give two sections about 8 inches long, and fetched my saw. When we bought our saw last year we went for a nice one that cuts going forward and backwards which makes life so much easier. 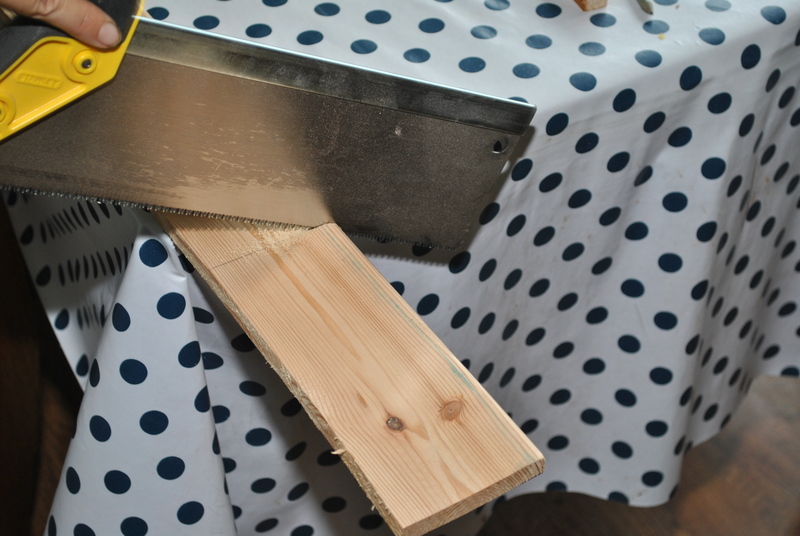 It made cutting through the soft pine pretty easy. To get rid of the rough bits I sanded down the edges using the roughest sandpaper I have. 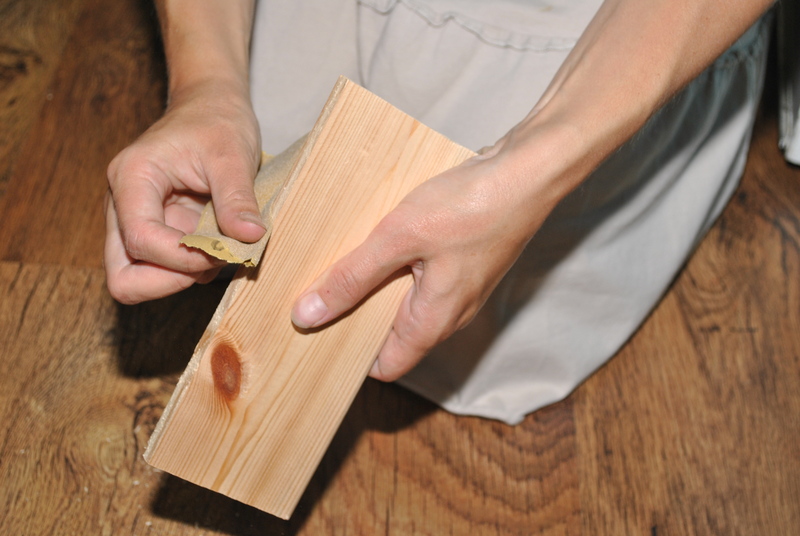 That way we aren’t in danger of splinters each time we fetch our keys! I decided to decorate it in a way my husband would like, as I know I say no to his … erm … ‘design ideas’? … quite a lot! He’s into comics and graphic novels and in our ‘yellow walls with red things’ hall, I thought that a decoupage using the bold colours of classic comics would look good. So as I got painting the wood red, using poster paint, I set him the task of choosing the pictures he wanted included in the decoupage. Luckily he didn’t choose any I didn’t like! 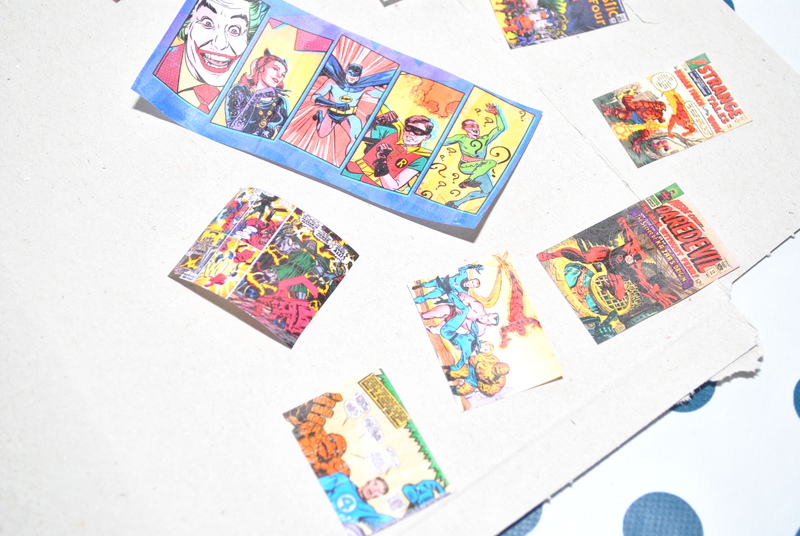 Once they were all shrunk down to size and printed out, I carefully cut out each picture and roughly laid them out to check we had enough to completely cover the surface. As it turns out we needed about twice as many as we had so it was just as well I checked! To stop the colour running between all the pictures when I started sticking them down I first had to seal them. 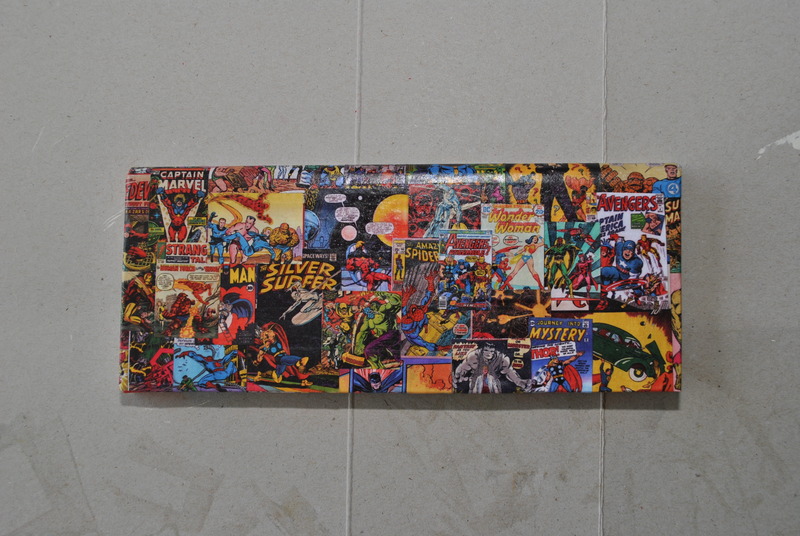 I did this by applying a thin layer of PVA glue to the whole front side of each picture and leaving it to dry. I needed a glue spreader to do this, but not having one I had to improvise: I used one of the side tabs from a cereal box and it actually worked extremely well! Once all the pictures were sealed and dry it was time to stick! 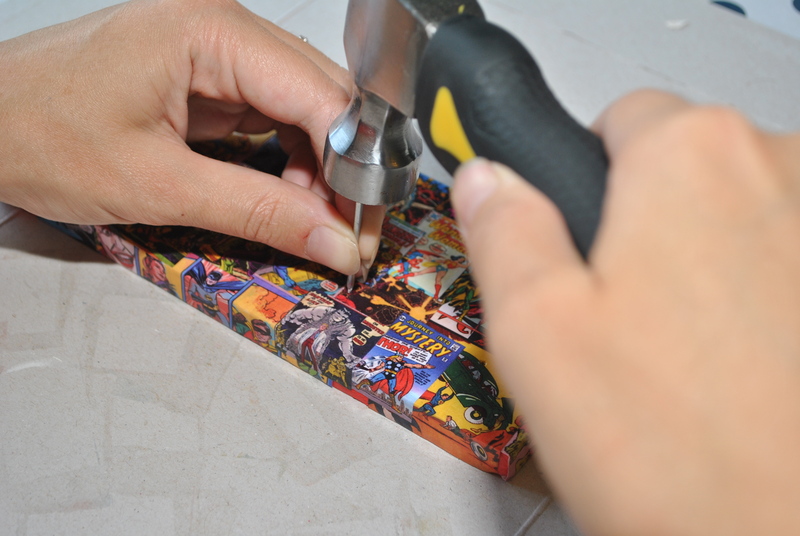 I started with the edges of the wood, using the same method of applying the glue as I used when sealing. I had a rough plan for which pictures should be at the surface and which could be partially covered, but otherwise I just laid the pictures where I thought they looked right. Whilst trying to silence my inner crazy person who likes everything to line up and be perfectly straight! 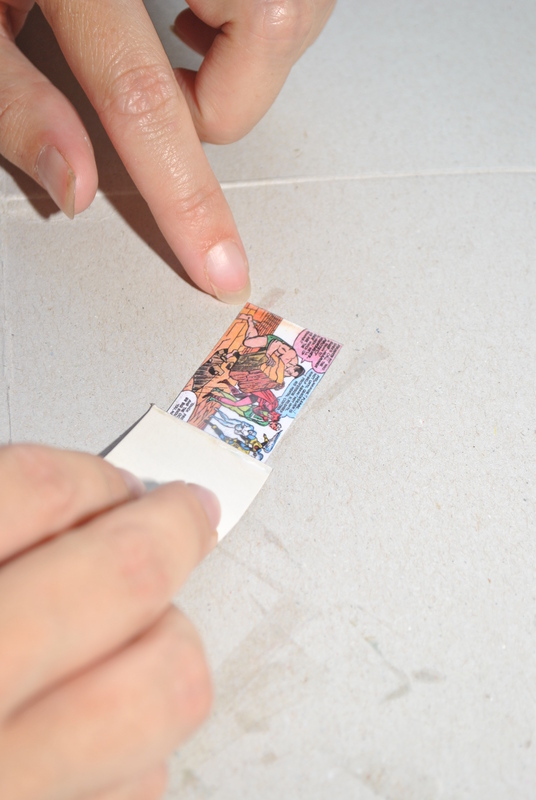 Once all the pictures were used and all the gaps were filled, I left the glue to thoroughly dry. To finish off the surface I sealed it by applying 2 thin layers of glue using my diy spreader, again letting each dry thoroughly before continuing. Now I know I’m bound to be biased but I think it looks pretty good! And luckily hubby does too! Then all it needed was the cup hooks to hold the keys. I started by measuring the width of the wood, which was 8 inches, and as I was using 4 hooks I marked spaces evenly at inches 1,3,5 and 7. 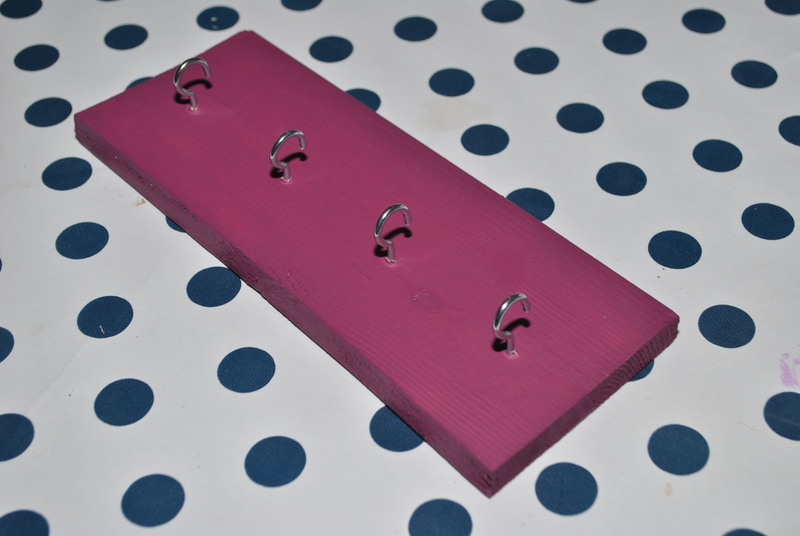 To make screwing in the hooks easier I made pilot holes using a nail which I hammered in a few mm then removed. Keeping the hooks straight was a little challenging due to their shape, so I just went slowly and kept checking from different angles to make sure they weren’t squint. The second reason I went slowly was to make sure the paper didn’t get chewed up by the screws. I attached a hanging loop to the back and the key holder was ready. Ta-da! The second one for the kitchen was much simpler. I painted it purple using the leftover paint from when we decorated the kitchen. The paint is specifically designed for kitchens and bathrooms, so using it on the wood should help to seal it and stop any moisture damage. I gave the front and sides two coats, for an even finish, and just did one on the back to seal it. I left plenty of time between the layers to allow the paint to completely dry. I put in the cup hooks using the same method as before, and now all it needs now is a hanging hook (which I’ve yet to buy…) and it can go up on the wall. Easy! Recently it was a friend’s daughter’s first birthday and I decided to go for the personal touch and make her a present instead of buying something. I wasn’t sure what to make her but inspiration struck one day whilst I was out shopping. I saw a canvas on a wooden frame in the same aisle as some Disney princess stickers and this gave me the idea for my project. 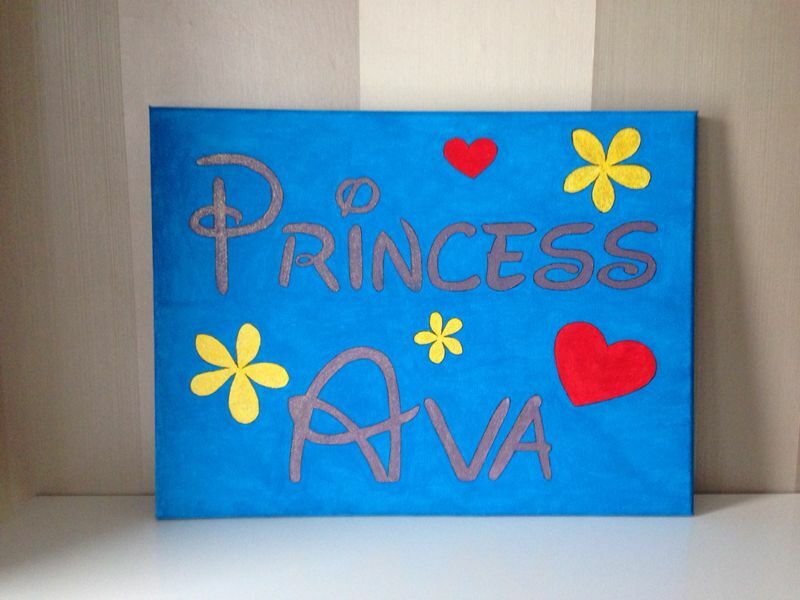 I decided to make a sign saying ‘Princess Ava’, but use colours that weren’t too girly so that the finished canvas wouldn’t be too sickly sweet! I also bought some tubes of poster paint in primary colours and gold glitter paint and I was all set. I started by sketching out the design on the canvas, using the free ‘Disney’ font. There are lots of free (and really cool) fonts available online (I just googled for it as I knew the name of the font I wanted, but you could also try places like dafont.com for inspiration), but as Disney was my inspiration I decided that’s the font I would use. The sketch was done freehand, but if it had been a more complex design I would probably have printed it out first and traced it. As it was, I was pretty pleased with the finished outline, so I started to paint. It became clear after the first couple of brush strokes that the picture would need at least two layers as it was not leaving an even finish. So I painted the whole of the blue background first. Then did two layers on each of the letters, flowers and hearts, leaving plenty of time in between each layer for the paint to fully dry, before finishing off the letters and flowers with a layer of the gold glitter paint. Once that was all dry came the second background layer and the whole picture was finished off by going around the outside of the letters, hearts and flowers with a black pen to give them nicely defined edges. Done! So Ava, I hope you like your birthday present!